Forest Glade is a historic private garden that is acknowledged as one of the most beautiful in Australia. It embraces a mixture of landscaping styles taking inspiration from English, Italian and woodland traditions. There are no bad times to visit Forest Glade Gardens - in autumn the various maples are a riot of colour, while in spring the rhododendrons, azaleas and peonies are a sight to see. Both summer and winter bring their own very special treats for garden lovers. The Spring bulbs and rhododendrons have finished, but the hydrangeas are looking magnificent as we move through Summer. The many shades of green foliage, and the cooling atmosphere they bring are a feature throughout Forest Glade Gardens at this time of the year. It is a soothing hint of the riot of Spring colour that is not too far away. Please note that Forest Glade Gardens are closed on days of Total Fire Ban in the Central district. Forest Glade gardens are not just for lovers of plants and horticulture, they are also a photographers delight. As well as all the colours Mother Nature has to offer, at every turn there’s something special to capture. 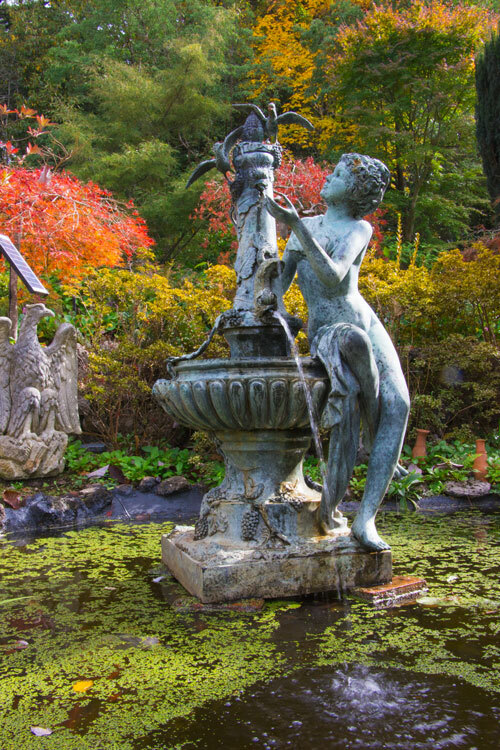 The gardens are also home to dozens of striking statues, ponds, fountains and water features. Forest Glade Gardens are often used as the backdrop to wedding ceremonies and wedding photographs.